Wn18 Colleville Plage, K.V.U.Gr Riva-Bella, K.V.Gr Caen. 10./ Grenadier-Regiment 736 of the 716th Static Division (Wehrmacht). 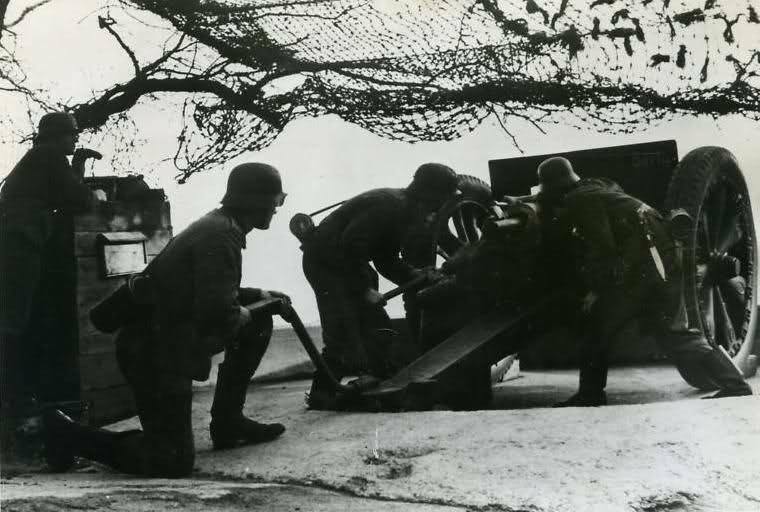 1 x Ringstand for a 5cm KwK gun. 1 x Pz.T.FT.17 turret on a U shaped Tobruk. 2 x Mine fields Mf.71 & 21. Pz.T.FT.17 turret on a U shaped Tobruk. These are all the defence positions printed onto this German map, also showing the command structure. Could this have been 10th Company, 738 Infantry Regiment. Longer Red - possibly huts for troops. Black line - barbed wire defence. Black straight lines - anti-tank ditches and an A/T wall. This area now is covered in houses, the road system is very much the same and it would have been with sand dunes along the beach. Trenches with a 5cm Pak on the Atlantikwall. The beach on a lovely day in November. Rommel inspecting the beach defences. Placing concrete defence on the beach. 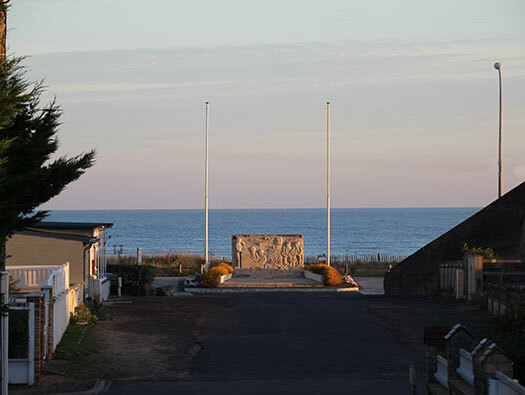 Wn18 Colleville Plage on D-day. This was the defence position of ''Skate'' the code name given to Wn18 by the ''Bigot'' Allied planners. Bigot map with all the defence positions marked on it. Fire support for ''Sword'' sector. HMS Dragon Transferred to the Polish Navy: On 15 January 1943 and on D-Day shelling German shore batteries at Colleville-sur-Orne and at Trouville. Wn18 Colleville Plage R612 casemate. This is how the R612 looked post war and still covered in sand. A captured French 7.5cm 231 F.K. (Field Kannon) it was a very old piece(1890's) and would have had trouble shooting at landing craft until they slowed down to hit the beach and then it would be deadly as any gun able to fire armoured piercing and high explosives. 7.5cm ammunition. It could fire high explosive and solid shot against tanks but had trouble following a moving target. Several AVRE's landed in front of the casemate and the 7.5cm Kannon managed to shoot tanks and landing craft before at least two rounds from a tank took it out. You can see the blast effects on the concrete. AVRE Petard armed Churchill tank. AVRE Armoured Vehicle Royal Engineers. Major General Sir Percy Cleghorn Stanley Hobart KBE, CB, DSO, MC. the General in charge of the 79th Div. 79th Armoured Division Black Bull the division in charge of all the ''Funnies''. The casemate viewed from the beach. There were no houses around here most that were had been demolished. The damage inside the casemate. 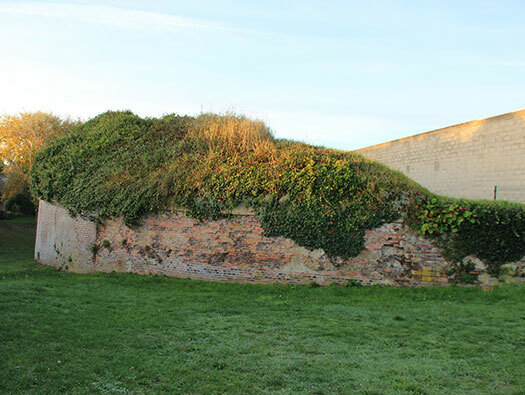 The side of the casemate which was covered in sand. The embrasure has been repaired. 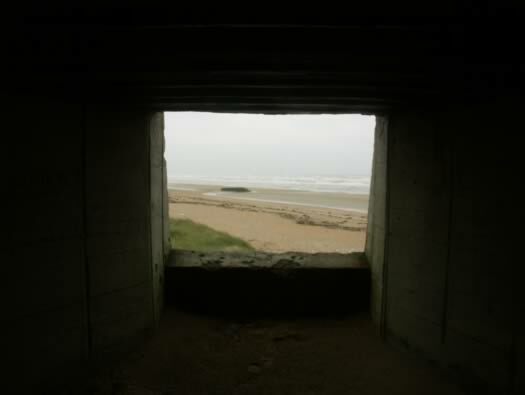 Although here it looks very high and imposing, on D-day it would have been covered in sand and grass growing so it would have been camouflaged with the surrounding sand dunes. R612 embrasure at Wn10 Hameau Mottet. R612 a very narrow field of fire..
R612 casemate the view from the landward side. The road to the French Redoute. French Redoute was used as part of the defence.. The 5cm KwK L60. This gun took out quite a few tanks and hit many landing craft. Pz.T.FT.17 turret on a U shaped Tobruk. A captured tank turret placed on a U Tobruk, a crew of one with shelving inside the Tobruk to stack ammunition. It would have held many hundreds of 7.92 rounds. Pz.T.FT.17 turret MG34 machine gun..
Plan of a U type concrete Tobruk. Pz.T.FT.17 turret on a U shaped Tobruk, this is where the turret was set on top of the Tobruk. All this area has now been built over. U shaped Tobruk from behind. Pz.T.FT.17 turret with the rear doors open. Wn18 beach defences with trenches on the edge of the beach and the R612 casemate behind. D-Day morning 6th of June 1944. The RAF & USAAF started bombing around 06.00am , then Naval units continued the bombardment and around 7.15am landing craft rockets fired on the beach, then around 07.25am the first units started to land to the west of Wn18. Once the bombing, shelling and rocketing stopped the landings started. The whole coast of France was segmented into code names by the Allies. 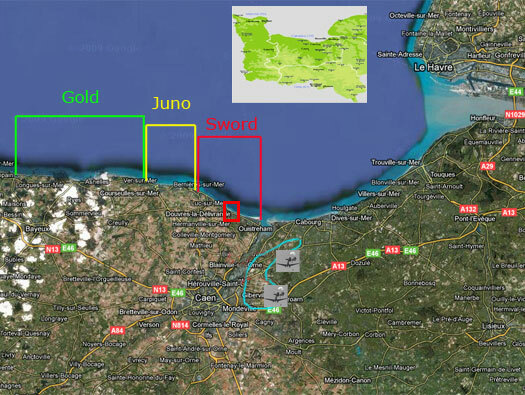 Here Sword Beach was split into Oboe, Peter, Queen & Roger and then again with Green, White and Red. Sherman Duplex Drive (DD) tanks running in to the beach. Infantry landing on Sword Beach. Wn18 is the V shaped roads on the left and the landings went in to the right of the picture. 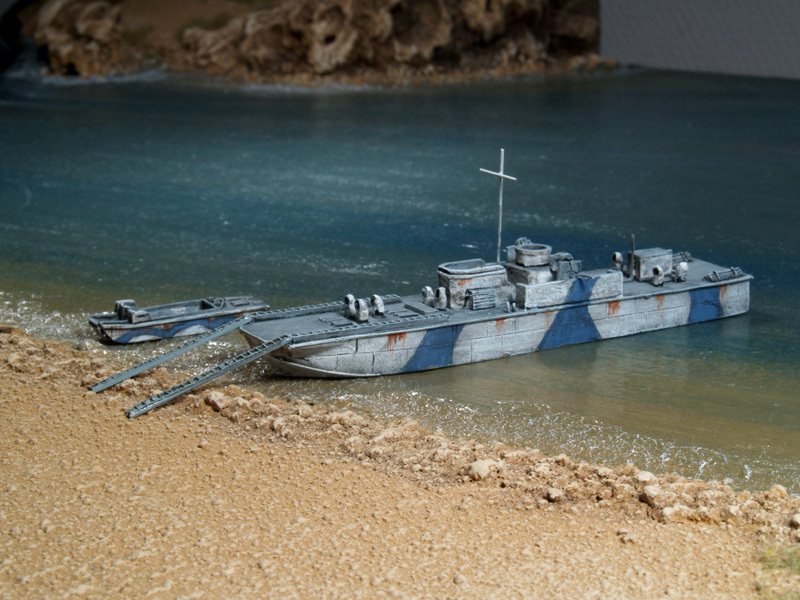 Landing craft and tanks were attacked by the guns of Wn18. Many of the tanks were hit until one fired at least two rounds into the embrasure. The R612 showing the damaged embrasure..
Sherman Duplex Drive (DD) tanks running up the beach. Sherman Crab flail mines up a beach. Looking down the beach to the west where the first landings took place. This is where the majority of tanks and soldiers came ashore on Sword Beach. The assault infantry here were the 2nd Battalion, East Yorkshire Regiment. Infantry sheltering on the beach. 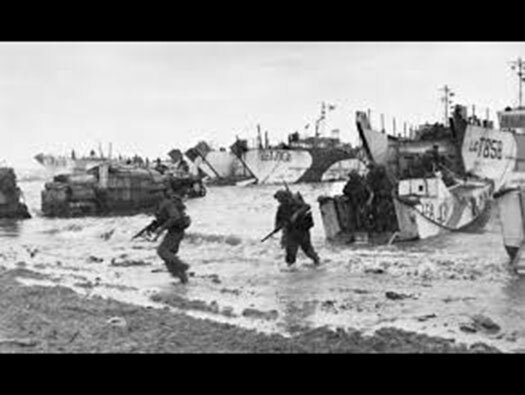 Sword Beach D-Day utter chaos. This is the German artillery fire plan. 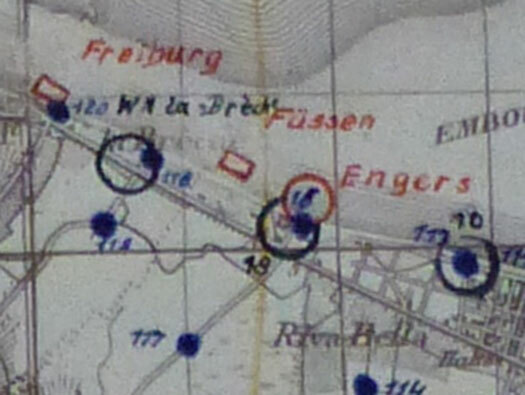 A Wn could call down fire on sectors in front of their positions and here they were Füssen and Engers. The German artillery continued firing until either they ran out of ammunition or were captured. About 09.05 the Commandos started to land. They came in closer to Wn18 and took a lot of damage from the beach defences. Many landing craft were disabled and some sunk. Quite a lot of Commandos were killed & wounded and as it was high tide with a strong westerly wind the surf was running and the landing ships with boarding ramps (like this one in the picture) had a lot of trouble off loading the Commandos as some ramps were washed away. Plan of a Fairmile LCI. A Centaur MK IV close support tank. This was a Cromwell with a 90mm short range gun that could support the Commandos on landing. About 46 were used on D-day. Centaur MK IV close support tank. Centaurs in pre D-day camps in southern England. Commandos ready to move off the beach. William "Bill" Millin the personal piper to Simon Fraser, 15th Lord Lovat, Commander of 1 Special Service Brigade on D-Day. Lord Lovat is at Bill Millins left arm in the water wading ashore. Lord Lovat at a planning meeting. Piper Millin playing to Commandos. Piper Bill Millin at Sword Beach.